Apr 4, 2016 | 18th-19th C.
I first discovered the paintings of Caspar David Friedrich in the mid-1980’s when I was an Assistant Professor of Painting at the University of Minnesota in Minneapolis. One morning as I was about to begin a critique of a graduate student’s work, a book on his painting table suddenly caught my attention. Its title was German Romantic Painting by William Vaughan. 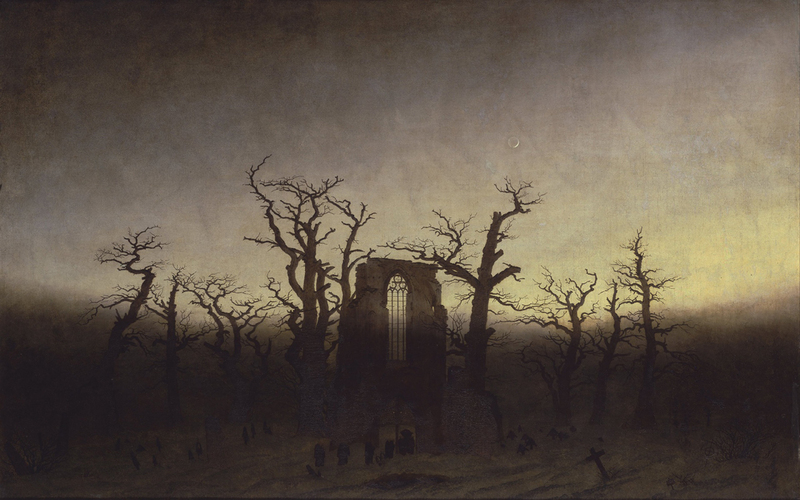 On the cover was a detail of one of Friedrich’s paintings, The Abbey in the Oakwood (1808-1810). I was immediately struck by the image’s dramatic lighting, its utter theatricality, its visceral “gloom and doom.” As late UCLA art historian Albert Boime put it: “Like a scene from a horror movie, [this painting] brings to bear on the subject all the Gothic clichés of the late eighteenth and early nineteenth centuries.” The image seemed to strike me more profoundly than virtually any other painting I had seen before. I was stunned at how I could be so seduced by these “painted clichés,” these idealized landscapes with their grand vistas, their dramatic lighting, their sentimentality. Was I responding to this work for all the wrong reasons? Didn’t they lack the edginess of the Neo-Expressionist fervor that defined much of painting in the 1980’s? Consider, for example, the broken plate paintings of Julian Schnabel or the graffiti-charged work of Jean-Michel Basquiat. 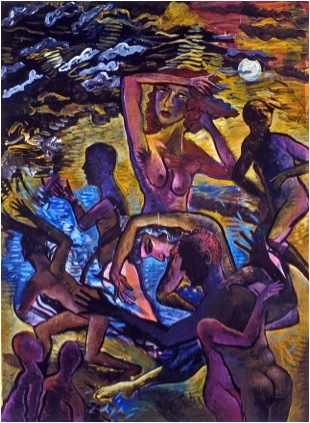 As it happened, I was working at the same time on a series of large figurative paintings replete with agitated, stylized figures floating aimlessly in a sea of post-apocalyptic muck. Their color was intensely saturated and the space was highly compressed. 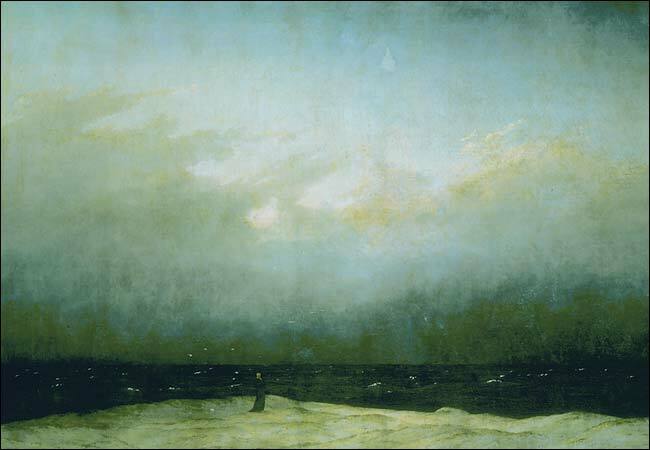 Quite naturally, then, I was intrigued by the extent to which Friedrich’s stark, barren landscapes with their distant, dramatically-lit vistas, could elicit a kind of psychological narrative. I recognized that these paintings evoked a similar kind of emotional weight that I was attempting to achieve in my paintings that by then had become excessively covered with expressionistic figures. I felt drawn to Friedrich’s use of dramatic tonal shifts from extreme light to dark and to the drastic scale shifts in which a tree, rock, or figure could appear so miniscule relative to these grand landscapes with their illuminated sunrises or sunsets (see for example his eponymous The Monk by the Sea [1809-1810] or Moonrise Over the Sea  or Picture in Remembrance of Johannes Emanuel Bermer ). 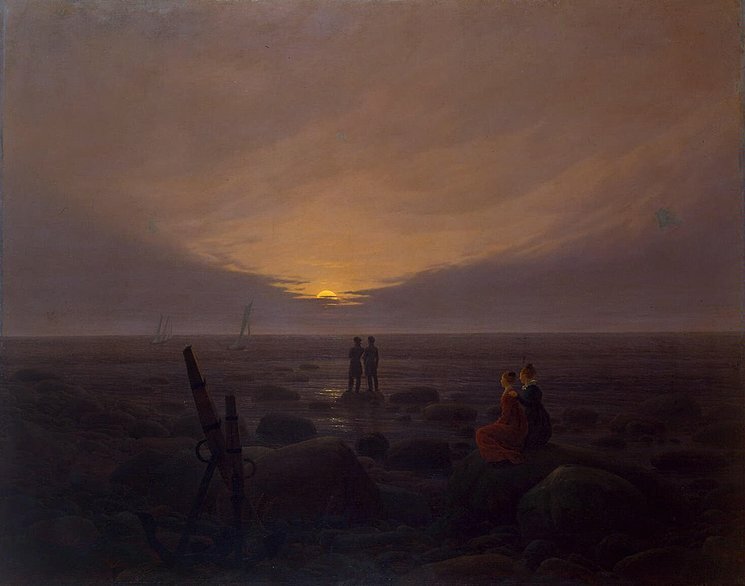 The profound, existential emptiness in these paintings, especially when compared to the figurative work I was making, caused me to wonder how Friedrich was able to achieve all of this in such a restrained, symbolic way. In short, it seemed an auspicious moment to re-evaluate my work in a different light. It was no longer sufficient for me to simply rely on what I already knew how to paint. Although my first real encounter with Caspar David Friedrich occurred almost thirty years ago, I am firmly convinced that, even if their impact is not immediately apparent in my current work, at least at a subconscious and philosophical level, his paintings continue to inform it. I like very much the works of ROSALYN SCHWARTZ and enjoy a lot what she writes on her relationship to Caspar David Friedrichs paintings – an eye opener towards her work ! Thanks Andreas. You are kind. 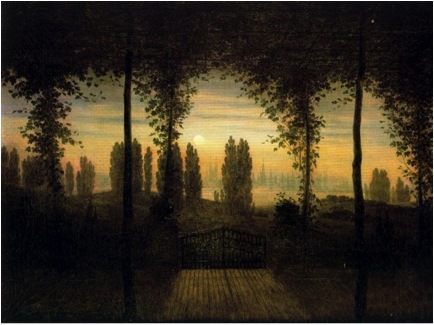 Friedrich’s pictorial atmospheres were deliberately lurid. Those skies were emblems of Nature’s disdain of mere humanity’s compromised institutions. In his own way Friedrich presages the revolutionary white on white of Malevich more so than the subtextual analytics of Impressionism. 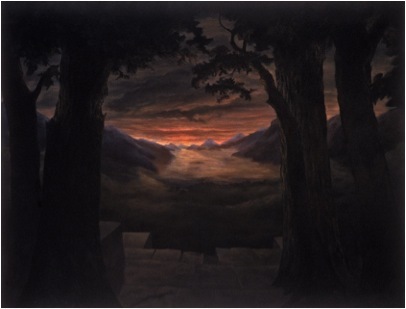 The trajectory of Schwartz’s subsequent painting shows how something of Friedrich’s haunted landscapes remains lodged within her art even today. Not had yours friedrich paintings drawn my attention too. The one with the moonrise touched my heart. It’s making me to see next sunrise. All other paintings are also quite peaceful.